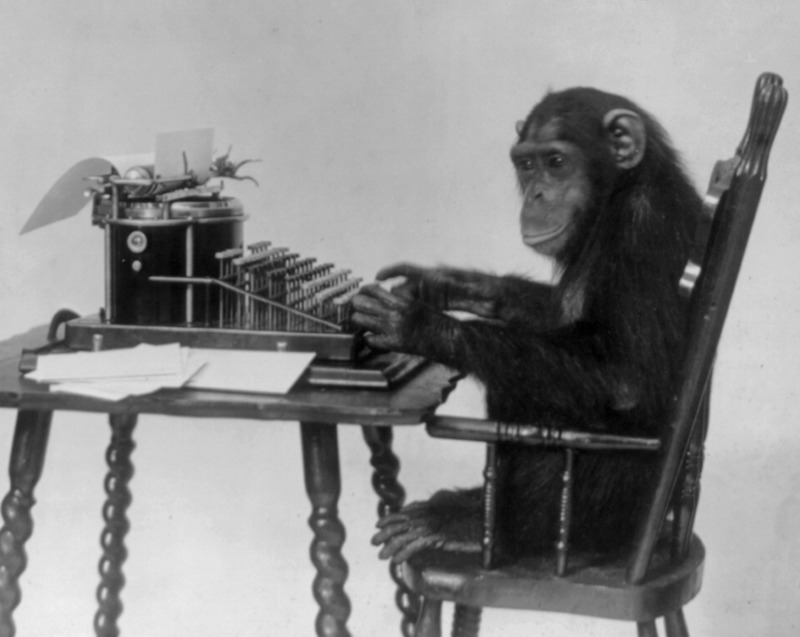 Having spent nearly 20 years in journalism all told, I saw plenty of unintentional errors show up in print, some by my own hand and others by friends and co-workers. Given that thousands and thousands of bits of information appear in even the smallest daily newspapers, mistakes and subsequent corrections are a regular companion of journalists everywhere. Occasionally, they offer a bit of levity. Most corrections, or their cousin, the clarification, are pretty straightforward, with the goal being to mend the mistake without repeating the error unless it’s absolutely necessary. Sometimes, however, corrections are necessarily hilarious. I was grateful to see my book “This Is the Story of a Happy Marriage” mentioned in Paperback Row (Oct. 19). When highlighting a few of the essays in the collection, the review mentions topics ranging from “her stabilizing second marriage to her beloved dog” without benefit of comma, thus giving the impression that Sparky and I are hitched. While my love for my dog is deep, he married a dog named Maggie at Parnassus Books last summer as part of a successful fund-raiser for the Nashville Humane Association. I am married to Karl VanDevender. We are all very happy in our respective unions. An April 5 story stated that Mary Fraijo did not return a reporter’s calls seeking comment. Fraijo died last December. Because of an editing error, an article on Monday about a theological battle being fought by Muslim imams and scholars in the West against the Islamic State misstated the Snapchat handle used by Suhaib Webb, one of Muslim leaders speaking out. It is imamsuhaibwebb, not Pimpin4Paradise786. The number “786” appears to have some importance to some Muslims, at least on the Indian subcontinent; something about giving numeric values to the Arabic letters of the opening words of the Koran. However, it is not a widely held belief among Muslims. Even so, one would think that given the overall conservative nature of most Muslim leaders, the handle “Pimpin4Paradise” would be viewed as a red flag – a bright, flaming- red flag. One could see “Pimpin4Paradise786” maybe getting by, say, the editors at the local Peterborough Prattler, but the New York Times? Oy! Developers are expected to make public early next month designs to raze a 88-year-old historic church in Worcester, Mass. Developers of the proposed Roseland Apartment complex will unveil plans, which include tearing down the former Notre Dame des Canadiens Church to erect a four-story apartment building, on Aug. 2 at a Worcester public meeting. The church, built in 1929, was closed by the Diocese of Worcester a decade ago. Multi-year efforts to preserve the structure have apparently failed. Worcester is said to be “in a renaissance of development, dining and culture,” and historic properties like the Notre Dame Church in its downtown have been targeted by developers to make for Worcester’s new future, according to the website Masslive.com. 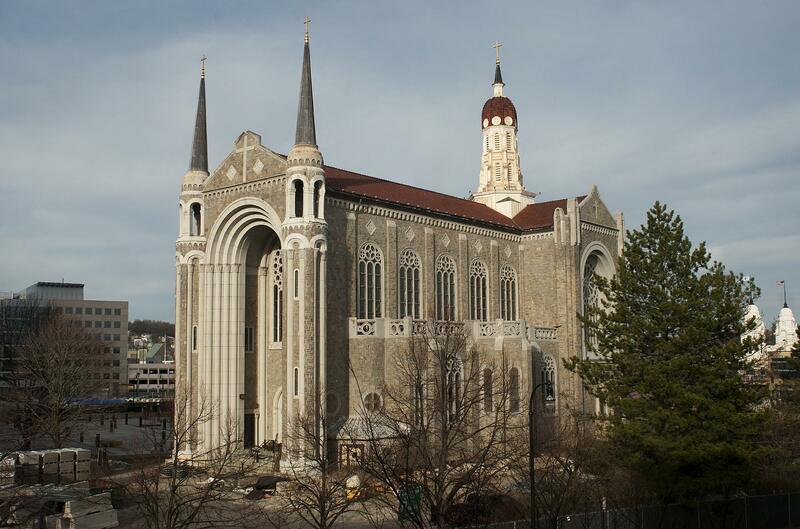 Located in the downtown of what was once a major industrial city, the church served for three-quarters of a century as the epicenter of Worcester’s once-large French-Canadian community. The Romanesque Revival style structure was the first French-Canadian Roman Catholic parish established in Worcester, and the mother parish to three later French Canadian parishes in the city. Historically, French Canadians represented Worcester’s largest immigrant population, second only to the Irish. While some artwork, historical artifacts and stained glass windows have been removed for reuse, many stained-glass windows still remain in the building, according to the group Preservation Worcester. It should be noted that the church is in desperate need of an overhaul, which would likely be quite expensive, given its size. That said, it’s hard to imagine a replacement that could prove anywhere near the draw for tourism. Over the past 20 years, many Roman Catholic dioceses in New England and the Rust Belt have had to consolidate and close churches as attendance and parish membership has dropped. Notre Dame des Canadiens is not listed on the state or national registers of historic places, but is listed on the Massachusetts Cultural Resources Information System. The church survived an earlier attempt at demolition. During the dreadful urban renewal efforts that swept much of the US in the 1950s and ‘60s, plans called for Notre Dame des Canadiens to be knocked down. However, strong opposition from residents from across Worcester resulted in the Worcester Redevelopment Authority dropping its plans to acquire and demolish the church. It doesn’t appear the church will get a second reprieve, however. One of South Carolina’s more celebrated architectural gems began as an antebellum bank. The Farmers’ and Exchange Bank Building, on Charleston’s East Bay Street, has been garnering the attention of locals and visitors alike since its construction in 1854. Its Moorish design made it a novelty then and now, and it caught the eye of famed writer William Gilmore Simms, who penned an article for Harper’s Magazine in June 1857. The building, built to house the Farmers’ and Exchange Bank, was designed by Charlestonians Edward C. Jones and Francis D. Lee in 1853 and completed the following year. Jones was an especially notable architect whose other works included the Church of the Holy Cross in Stateburg and Charleston’s famed Magnolia Cemetery. The Farmers’ and Exchange Bank building has rounded horseshoe arches and a façade featuring pale Jersey and darker Connecticut brownstone, giving it a striped effect typical of many Moorish structures. Its design is thought to have been influenced by illustrations in Washington Irving’s 19th century work, Tales of the Alhambra, a revised edition of which was published two years before construction. 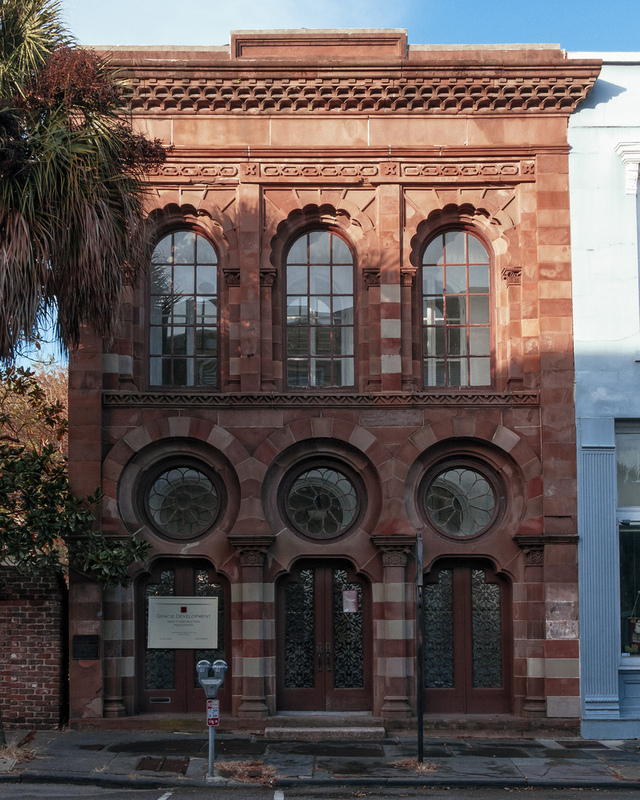 The structure was built by David Lopez, who also constructed Charleston’s Kahal Kadosh Beth Elohim synagogue and Institute Hall, where the South Carolina Ordinance of Secession was signed in December 1860. The Farmers’ and Exchange Bank continued in Charleston until Federal bombardment of the city during the War Between the States forced the bank’s move to Columbia. It didn’t survive the conflict. Later, the structure was used for a variety of purposes, including a Western Union telegraph office, office space for long-time Sen. Ernest “Fritz” Hollings and, most recently, a restaurant. By 1970 there was talk of tearing the building down to make room for parking; however Charleston banker Hugh Lane Sr. spent $50,000 to preserve the structure in the early 1970s. An old veteran, or a very, very old veteran? Most of the graves at the Marietta Confederate Cemetery, just outside Atlanta, are unmarked, holding the remains of Southern soldiers who died during the Atlanta campaign, including many killed at the bloody Battle of Chickamauga. There are, however, several dozen graves of men who died decades after the war, living out their lives in the nearby Georgia Confederate Soldiers Home. Among these was Lorenzo Dow Grace, who, according to his gravestone, lived to the ripe old age of 115 before dying in 1928. ‘From the best information obtainable, which seems to be fairly authentic and, to say the least of it, is indisputable, Lorenzo Dow Grace was born on October 29, 1813, in Buncombe County, N.C. From this it will be seen that he will be one hundred and thirteen years of age on the 29th of October, next. He is in splendid health and as ‘lively as a cricket.’ He walks a great deal (without the use of a cane, by the way), and runs errands for the other old men at the Home. ‘Moving from Buncombe County, N. C., to Ellijay, Gilmer County, Ga., while yet a young man, he engaged in the occupations of wood chopping and gardening for the public, therefore spending almost his entire time in the open air of the mountains of North Georgia, which, no doubt, accounts in no small way for his longevity. Confederate pension application for Lorenzo Dow Grace from 1903, showing Dow’s date of birth as 1828, rather than 1813, as was later stated, making him at least 15 years younger than later stories indicated. Click to embiggen. He attributes his longevity to his life in the open and to his simple habits. Most of his life was spent on a farm, and when that work became too much for him, he went to chopping wood for a living, and he made it until his third wife died and he was left alone, his children of an earlier marriage having died of ‘old age.’ So he decided to lay down his ax and live for the next ‘forty years at least’ on the bounty of his State as a reward for his services to the Confederacy. He also served in the Mexican War, and even then was not a youth. He says that he never had much time to waste in his life, and he never expects to get too old to learn. He eats an apple every day and drinks in the sunshine of the out of doors, and thus stores away strength and energy far beyond the time of the average life. 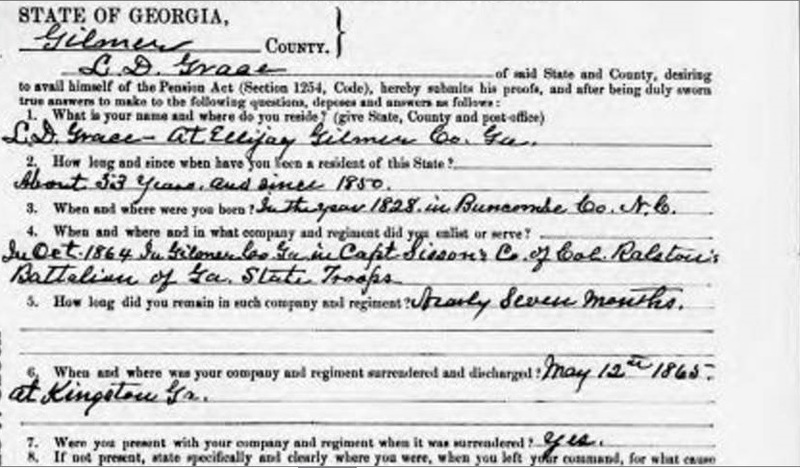 However, Grace’s Georgia’s pension application, filed in 1903, states that he was born in 1828, meaning that the aging Confederate was approximately 100 when he died. No mean feat, particularly 90 years ago, but definitely more common than making it to 115. Of course, it’s quite possible that information such as that found in pension applications was inaccessible while applicants were still alive and, given Grace’s age, he could well have lost track of his own age. On the other hand, he might have been looking for some late-in-life publicity. 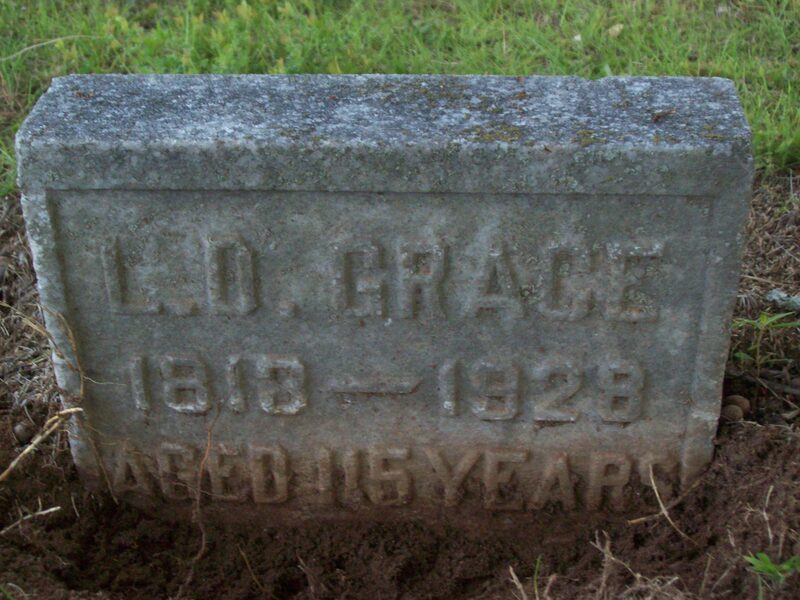 Grace, of course, didn’t make it too much longer past his bit of fame in the Confederate Veteran. And whoever was tasked with making his gravestone was apparently none the wiser regarding the aged veteran’s actual birth year.